Jerusalem has already been conquered twice. The first time, the Babylonians took Daniel and the noble families of the land (Dan 1:1–3, 6) back to Babylon. Eight years later, the Jews rebelled, and the Babylonians took the king and 10,000 captives. One of those captives was a priest named Ezekiel. All this had happened because the Jews had broken God’s laws. They were supposed to worship God and God alone, but they turned to the idols of the surrounding nations. They desecrated the temple of the Lord and brutally persecuted His prophets. So God disciplined them (like He said He would in Deuteronomy). The Babylonians came once. Then they came again. But instead of turning to God, the people still chased the gods of the nations. They still mistreated the poor. They still disregarded God’s laws. Now it’s been five years since the Babylonians last attacked Jerusalem. The Jews in the city would soon revolt again (2 Ki 24:20), but they’d been rebelling against a far greater King than Nebuchadnezzar for a long, long time. Israel has a worship problem that they cannot, cannot fix. But even now, God doesn’t leave them without hope. He chooses a man to speak for Him to the people, to tell them the error of their ways and teach them justice. He chooses a watchman to warn Israel of the coming storm (Eze 3:17). The people have broken God’s heart with their lewd idolatry and self-serving leaders. Because of Israel’s rebellion, God is withdrawing from and destroying Jerusalem. But the good news is, that’s not all he sees. God will render justice not only on Jerusalem, but on all the other nations who have led her into idolatry and celebrated her destruction. God will form a new covenant with the people of Israel. He will lead them Himself as a good shepherd, and they will be reunited under David. God will defend Israel from her enemies in the dark future. There will one day be a new temple in Jerusalem, and the glory of the Lord will one day return. Ezekiel may be the watchman, but it’s really God who is watching out for Israel—even as she rebels against Him. You can see Bible verse art for every book in the Bible, or you can check out more art by Laura Kranz. Ezekiel is the fourth of the Major Prophets. When God had a message for the people, He spoke to them through prophets: men moved by the Holy Spirit to speak on God’s behalf. Take a spin through Ezekiel and you’ll find angels with four faces, wheels with eyes, and dry bones growing ligaments (which I imagine was like watching a zombie film backwards). But Ezekiel isn’t the only prophet to have these kinds of visions. Daniel, Zechariah, and John have visions of a similar stock. God takes away Ezekiel’s voice, rendering him mute for 7 years(Eze 3:27; 33:22). He can only speak when the Lord has words for him to share with the people. Ezekiel is tied to the ground on one side for 390 days, and on the other for 40 days. He eats cakes cooked over cow feces for that time, too. Ezekiel’s wife dies, but he is forbidden to mourn the loss. Her death is a sign that Jerusalem will be destroyed, and Ezekiel’s response will mirror the Jews’. Ezekiel prophecies during the same time period as Jeremiah, but while Jeremiah is in Jerusalem and Egypt, Ezekiel is in the land of the Babylonians. 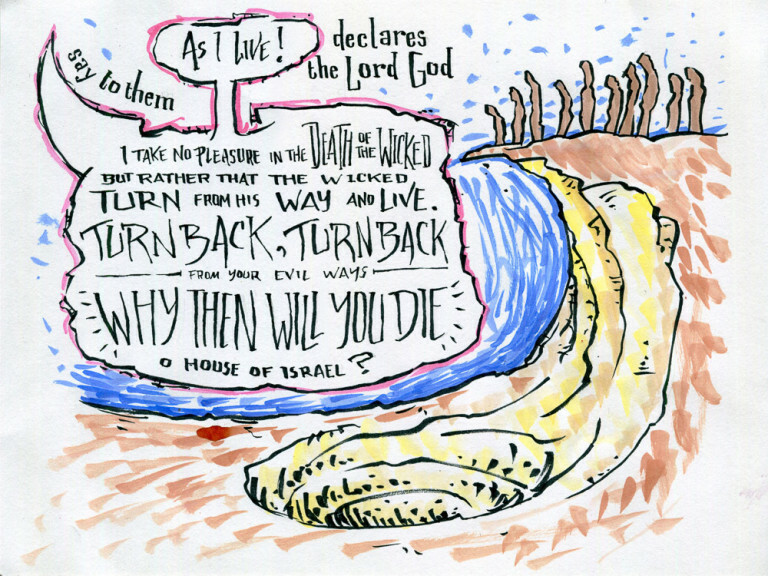 Ezekiel gives us a glimpse of the new relationship God plans to make with His people. His Holy Spirit will dwell within them (Eze 37:14). His glory will be among them (Eze 43:1–9). He will be their God, and they will be united under a righteous king (Eze 34:24). Ezekiel also devotes a great deal of attention to what the restored Israel’s land and temple will look like (Eze 40–48). Ezekiel is the watchman, and through him we see some of God’s generous plans for Israel that have yet to come about.